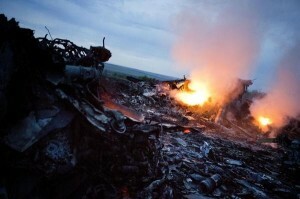 We can say with confidence that the tragedy of Boeing 777, which took the lives of 298 people, has brought the conflict in Eastern Ukraine to a principally new level. Now the main centers of power—Russia, the US, and the EU—must make themselves known and must take the responsibility for stopping the war or conversely—for its practical legitimation and expansion. Even considering the possibility that the plane was shot down by mistake, it is events of such magnitude that divide history into “before” and “after.” “After” such an event the possibilities of such “strange,” “hybrid,” and other “wars without war” become exhausted. Over the past several months, as a constant stream of people and weapons passed across the gaping hole of the Russo-Ukrainian border, the nerve centre of the diplomatic struggle between Russia and the West was the question of whether Russia had a sway over the rebels or whether this was an intra-Ukrainian conflict. By giving a different answer to the question, each side could then propose a dramatically different solution: Russia needed a consensus around the idea that Ukraine was undergoing a “civil war,” which could be only ended through the dialogue of the outside parties, who would agree to a division of Ukraine into spheres of influence. The U.S., on the other hand, insisted that the conflict needs to be seen precisely as a form of undeclared but very real intervention by Russia on Ukrainian territory, that is, a variation of good old military operations, of which U.S. itself has a long and established record. A direct consequence of such a conclusion was the not-so-successful strategy of “containing” Russia, the gradual imposition of sanctions and other activities, which could force Putin to “end the war,” which he could end as easily as he began it. Compromises in this struggle to define what is taking place would mean a direct path to defeat for each of the sides. Can Putin do this in reality? Does he have such a direct control not only over the rebel leaders but also over the regular rank-and-filers? Such questions have now been put in brackets, possibly forever. The space for maneuver Russian foreign policy enjoyed came to a sudden end somewhere over the Donbass region, at a height of 10,000 m.
It seems that both underrate the scope of the destructive work conducted since this spring by the Russian state over Russian society. “The New Putin Majority,” cheerfully announced by Kremlin sociologists, seems in the immediate future ready to accept any actions proposed by its rulers. A combination between abstract aggression and fear before the ghosts of instability—these are the impulses governing the majority of our countrymen, who are ready to accept anything as long as the images of war and destruction from their TV screens do not move into their own apartments. It will take a lot of time and patience before the feelings of dignity, the ability for independent thinking, and most importantly, the capacity to fight for their own rights come back to Russia. -To play the role of a democratic leader and let international organisations (OSCE, UN, NATO) to make the needed investigations of the terrorist attack and perhaps to establish a tampon zone in that territory. Of course, this will lead to the giving up of any Russian claim to the territories in the Eastern Ukraine. But this is the only way for Russia to survive. To survive as an important partner. Otherwise, Russia will descend in a dark zone for many decades. Therefore, the choice is: become part of the civilised world and bring prosperity for its own people, or sink Russia in the dark ages of wars and troubles (don’t forget the independentist movements within Russia. We are all looking forward for these to happen! :-). The commentator who calls himself “The Saker” has posted an analysis of the shooting down of the plane at http://vineyardsaker.blogspot.co.uk. The analysis appears to be based on considerable technical knowledge (but then lacking such knowledge myself it is hard for me to judge). He considers six possibilities — deliberate or accidental action by Moscow, Kiev or East Ukrainian rebels. He concludes that the most likely variant is a deliberate (and evidently highly successful) “false flag” operation by the Ukrainian government, with accidental action by rebels the second most likely variant. In fact, these two explanations can be combined in a way that I find plausible. Perhaps the rebels shot down the plane after Kiev deliberately sent it into harm’s way. Perhaps other civilian aircraft had already been routed through the war zone without getting shot down and this was the first time the gambit worked. I’m not in a position to assess the more technical aspects, but it does seem very strange to me that air control in Kiev should have approved the plane’s flight path, given that the Ukrainian Security Council had previously issued the sensible instruction that civilian aircraft should avoid the war zone. Is that just a matter of muddle and incompetence? Well, it’s all true—at least if you live in Russia, because this is the Malaysia Airlines crash story that you’d be seeing…. Watching some of these Russian newscasts, one comes away with the impression of a desperate defense attorney scrounging for experts and angles, or a bad kid caught red-handed by the principal, trying to twist his way out of a situation in which he has no chance.